MoldHold is the only tool specifically designed to quickly and easily trap airborne toxins at their source — wet or dry. Since 2010, remediation professionals around the world have used MoldHold to protect the health of their employees and clients as they deal with mold, asbestos, lead, and other contaminants. The key to effectively eliminating a mold problem is to deal with the issue quickly. Traditional area containment with plastic and tape are tedious and time-consuming — and are not engineered to adhere to wet surfaces. This can prevent effective containment and removal of the mold until everything is dry enough. In the meantime, spores will continue to release into the air. With MoldHold, you can contain mold at its source, even before the area around it is dry. Instead of needing multiple people to seal off a room to limit the spread of mold spores, one or two people can apply MoldHold to the affected surface and prevent more spores from getting into the air—as soon as mold is discovered. Taking steps to keep toxins out of the air immediately will put home and property owners at ease and demonstrate that you are on top of the problem. Quick action in containing mold and other airborne toxins like asbestos and lead not only helps prevent their spread through the air and into HVAC systems, but it also keeps them out of people’s lungs. Area containment helps control the spread of contaminants that can cause medical problems ranging from allergic reactions to serious, long-term illness beyond a nearby area. Anyone within the contained area, however, faces exposure without proper protective gear. You can reduce your workers’ and clients’ exposure to airborne toxins even more than you already do with traditional area containment. MoldHold is the only tool available that has been engineered from scratch to prevent the spread of contaminants through the air — remediation trainers now include MoldHold among the tools you should have to safely clean and restore a site. It is no secret that remediation is often an expensive process. Homeowners face caps in their insurance policies’ coverage — if they have coverage at all. Insurance companies want to keep their costs on claims as low as possible so they can maintain profits. Remediation professionals find themselves caught in the middle, trying to balance cost of materials, labor, and business in general against making sure everyone they answer to is satisfied and safe. MoldHold was designed with feedback from remediation professionals about the kinds of costs they wanted to be able to control. 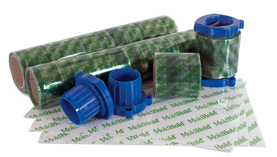 The materials and time it takes to cordon off an area with tape and plastic were first among those, so MoldHold products are designed to be easy for just one or two people to apply — and to stay applied without falling down, even on wet surfaces. Beyond that, our users reduce wear and tear on expensive equipment like air scrubbers (and their filters) and respirators. MoldHold lets its users work faster and smarter — and that adds up in their bottom lines.